This pattern makes a nice sized afghan perfect for snuggling in front of the TV or outdoors by the fireside. Holding two strands together, chain 102 loosely with 10mm hook. Row 2: Sc in the top of Tr space, then Sc to the end of the row. Be sure to Sc in the top of the ch1 space at the end.Ch 1. turn. Row 3: Tr in 2nd Sc space. Sc in next space. *Tr in next Sc space, Sc* repeat to end of row, ending with a Sc. Ch 1. turn. Repeat rows 2 and 3, 44 more times, ending with a "row 2". You should have 46 rows of nubbies total. Edging: At the end of the last "row2", ch1 but do not turn. Sc in same hole and turn work 90 degrees. *Sc evenly spaced along the left side to the corner. Ch1, Sc in same hole and turn work 90 degrees to form corner. * Repeat across bottom and right sides of the blanket. I've made your Nubbie Scrubbies and love them. My printer is down. Is this the same pattern only on a larger scale? Yes! It is very much like the Nubbie Scrubbies pattern only larger and bigger. Uses different dimensions, but it is the same basic idea. Any recommendations for how to modify this to use a super bulky weight (6) yarn instead? I'm wanting to use Bernat Blanket.... Thanks for any ideas! Sure, try it with Super Bulky weight yarn. I would probably try it with just one strand and maybe experiment with different hook sizes until you get the right tension for the yarn you use. My guess is that it may be a bit smaller hook than the 10mm. So you may want to add more width and length to your dimensions as well. The multiple for the pattern is 2, so just add more stitches and rows in multiples of 2. Hi, just wondering if all of the single crochets in row 2 should be done in the space or if they should be done in the stitch (excluding the first and last sc)? Thanks! Yes, all the single crochet should be done in the stitches. Could you maybe please explain the edging in a little more detail. I am totally lost on that part. Sure. The edging is simply single crochet all around the perimeter of the blanket. Just do two sc in the same hole in each corner with a chain 1 in between, then continue along the next side until you end up where you started. If you just start doing it, I think it will become clearer. Good luck! What is the dimension in this blanket? The dimensions are 60" × 60". It depends a lot on your choice of yarn and on your tension. For me, mine turned out to be 63" x 63". 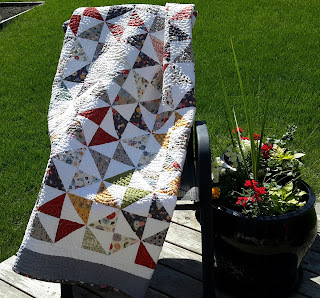 Can I make this on a smaller scale with the bernat blanket yarn? For a lady say about 5ft 3in? What would you recommend? Also how heavy do you think this blanket is? Sure! I would definitely try it! My blanket weighs about 5 lbs. I recently made another one using just one strand of Bernat Chunky and it turned out great! I'm not sure how many skeins I used because I didn't keep track. I just added more until I got the size I wanted. It turned out very nice and soft! Bernat Blanket yarn looks really soft and I bet it would turn out nice. I would recommend just one strand for that as well. I love this blanket! Do you remember what brand and color of yarn you used? I used Red Heart Comfort yarn. Worsted weight with two strands held together.2000 grams total. The color was called "Gray". Do you think this blanket would look good with two different colors being stitched together instead of using 2 of the same color? Yes. That would look great! How many single crochet stitches should you have in each row if you follow the pattern as is? 100? Is the TR and the SC in the same stitch? No, the SC is in the next stitch. Thank you for sharing this pattern. I have a grandson who is colorblind and this would be perfect for him done in shades of green which is the only color he sees accurately. Beautiful blanket! How would I make this in a smaller version? Like for a baby and toddler? You could make this for a baby by using a smaller hook and finer yarn. I have made it with baby or dk weight yarn and a size 3.5mm hook. The rest of the pattern is the same. It turned out great! Is this pattern in US terms or UK? Hi! I love your work and would like to make the Hubbie Nubbie up as a blanket measuring approx 60" x 75" using a super chunky yarn on a 12mm hook. Do you have a way of calculating how much yarn I should purchase? With thanks. Im sorry I don't have anyway of calculating how much yarn it would take. I have made this blanket using a super chunky yarn with a 10mm hook and it turned out great!! Unfortunately I forgot to record how much yarn it took to make exactly. I just origionally guessed how much I would need and ended up having one ball left over when it got to the size I wanted. My blanket is 60"x 75" finished and it weighs 2086 grams or around 74oz. Hopefully that will help you be able to figure out a rough estimate of how much yarn to purchase. Good luck! I'm on my fifth row and have noticed that one side has the "nubbie" closer to the edge than the opposite side. Is this normal? I don't think that is normal. The nubbie should be close to the end on both ends. There is just the chain 1 before the Treble crochet (nubbie) at the beginning of a row, and there is one single crochet after the Treble crochet at the end of the row. Also the nubbies should line up vertically as the blanket progresses. If they are off-set, then something is wrong on the previous row. Hope this is helpful. This is a beautiful blanket! I've made it twice but still have one question... Working on row 3, what is the difference between crocheting into a sc space and a sc chain? It doesn't seem possible to tr and sc into anything but the sc chain, since row 2 is comprised only of single chains. Thank you! Thank you, Bree. Yes, I think you are right. I think I should have said to sc in the next sc space rather than chain. The chain spaces are only on row one because that is what you are crocheting into, but on row 3 there is only single crochet spaces to crochet into. Thanks for pointing that out. I will clarify the pattern! I think you are right! I will change it. I just started to make a new Hubby Nubby myself and found the same thing. It works out better when starting from the 3rd chain. Thanks! Hi Angelee. I love this afghan. That said, making it for my friend is turning into a true test of patience and labor of love. I have now ripped it out for at least the sixth or seventh time. The problem I’m having is keeping the ends straight. I’m using markers and everything. Do you have any hints or tips? Thank you. I know, this is labor of love. It seems simple, but it really is a bit more challenging. I am making another one too right now for my son and his wife and I also have to take it out every so often. It is a little tricky because the counting really has to be precise and I find if I make a mistake, it usually doesn't appear obvious, but it affects the counting in the next row. Usually I make the mistakes in the single crochet row and then find out about it in the treble row after so I end up having to rip back two rows! I check often as I go to make sure that the "nubbies" are lining up vertically. If they are not, then you know there is a problem. The problem is usually on the row underneath (the single crochet row) it is just that I either skipped a stitch or did two in the same space. The other tricky spot is at the end of the row of the single crochet (row 2), make sure to put a single crochet in the top of the chain from the previous row. It may seem like you are done, but it does need that last one for the counting to work out for the next row. Hope this helps! Good luck! Hi there! I’m so excited to make this blanket, I’ve ran into a problem though. My nubbies aren’t “nubbing”! Any advice? I’ve tried changing up the hook size. I tried a 9, 10, and 11.5. I’m using 2 strands of Worsted weight yarn. The swatches I’ve made just look flat. Thanks! Hmmmm. I'm not sure what is going wrong. I would make sure that you are looping the yarn over the hook twice at the beginning to make the treble stitches. Also make sure the single crochet stitch isn't too loose in between. This will help anchor the treble stitches as they bend to form the nubbs on the back side of the work. Also the smaller needle would probably help so it isn't too loose.